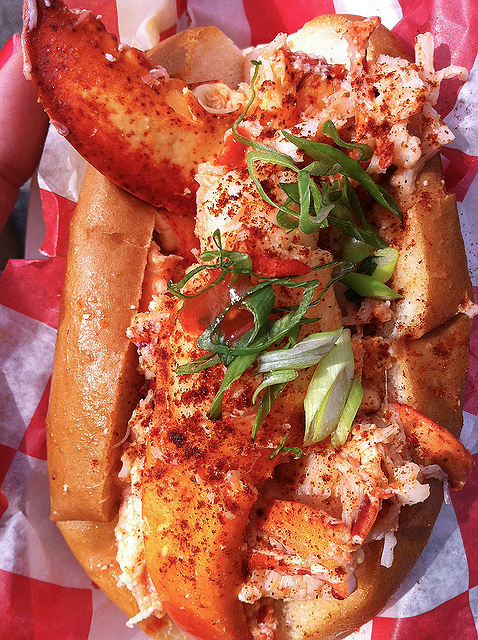 Lobster can elevate any dish from classic to the divine. The quesadilla is a popular street food in Mexican cuisine and traditionally made with cheese, beef, or chicken. But not all quesadillas are created equal. 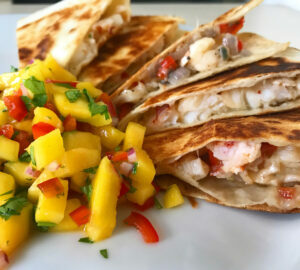 By stuffing them full of rich buttery lobster and topping with a sweet tropical mango salsa, this street food is taken from a late night delight to a beachside retreat in a single bite. In a saute pan, add one tablespoon extra virgin olive oil and one tablespoon of butter. Next, add the red onion, red pepper, garlic, and salt and saute over medium heat until vegetables are semi-tender, about three minutes. Add chopped lobster meat to onion mixture and cook to heat through about one minute. Place in a medium-sized bowl and set aside. Wipe the saute pan clean with a paper towel. Add the remaining tablespoon of olive oil to the saute pan and heat on medium temperature. Lay out tortillas on cutting board and put the Monterey jack cheese on one half of each tortilla. Top with lobster mixture and fold the tortilla over. Place back into the pan and cook for three to four minutes on each side until golden brown. Finely dice the mango, red onion, and red pepper and toss together in a medium-sized bowl. Finely chop the cilantro and add to the mango mixture. Lastly, add lime juice and salt and mix until fully incorporated. Serve on the side of the lobster quesadillas. Enjoy!